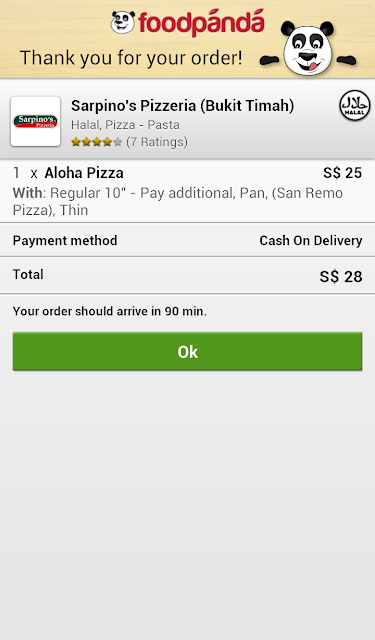 [SG] Foodpanda.sg | your one-click solution to quality food served to your doorsteps! Has it ever occurred to you that you could enjoy quality restaurant food at the click of a few buttons and enjoy it all at the comfort from home? We were exploring dinner options and did not want to have the usual fast food that was available on delivery service. Some searching efforts led us to discover this website, Foodpanda, which endeavours 'to serve people a sumptuous meal without any hassle' and intends to make food delivery an easy and convenient option for all food lovers! During our recent trip to Bangkok, we similarly spotted Foodpanda's presence and its services in the city and decided to give it a shot. It would be a fair statement to assume that most people nowadays carry a smartphone that runs on either the iOS or Android operating system and we realised that they have a handy app. Feeling tech-savy, we thought it would be interesting to test if the app was secured and stable enough to handle an order and a few hungry foodies! Upon logging into the app, we were prompted to input the country of residence and the delivery post code. Thereafter, the app ingeniously shortlists the restaurants that deliver to the area and there were even hand-picked deals by Foodpanda themselves! There was even a rating system for all participating restaurants so customers could browse through the reviews put up by satisfied or disgruntled customers. Among the many deals on offer, we were particularly attracted by this value for money one-for-one pizza deal by Sarpino's Pizzeria! Even though Sarpino's Pizzeria has several branches, it automatically chooses the nearest branch closest to the post code entered. We were pretty excited by now (well, it was something new to us afterall!) 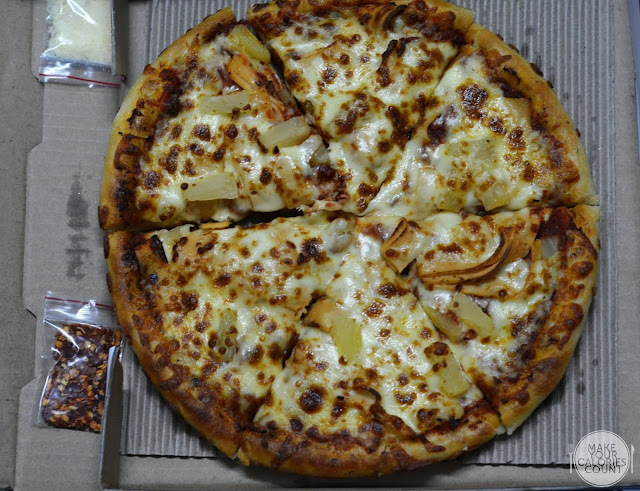 and we chose the 'Aloha Pizza' which resembled that of the classic Hawaiian pizza. Do note that the food served at Sarpino's Pizzeria are all Halal, so it would suit the Muslim foodies just fine! Just when we were thinking about how to go about with the 'one-for-one' deal, we followed the on-screen instructions. 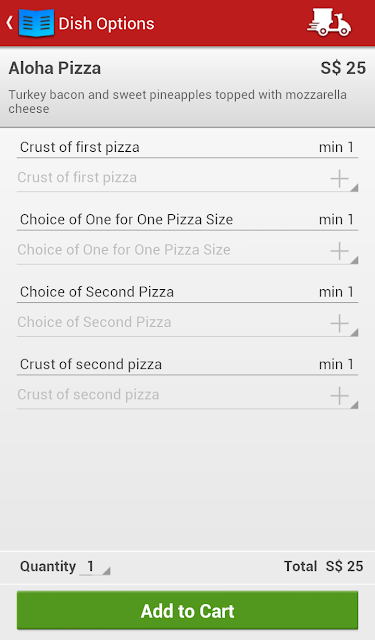 We were then prompted the following, whereby we would have to choose the pizza size and the type of crust (either 'pan' or 'thin') and also the second pizza of choice. Moving on, we arrived at the 'Checkout' screen and was prompted to input the delivery address, order confirmation mobile number and an optional section for order comments. 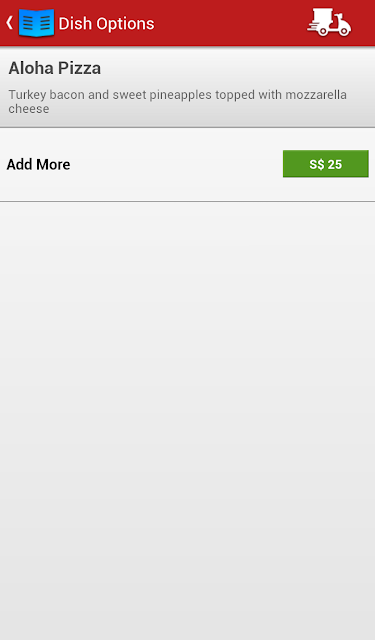 On the payment methods, we decided to leave it as 'Cash on Delivery' ("COD") since this was the first time we were trying and decided to play our cards safe. A later check through their website revealed that payment options come in three forms, COD, PayPal payment or Visa online. 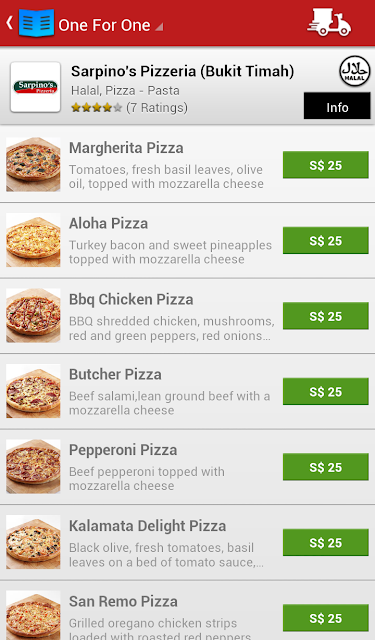 Depending on the selected merchant and restaurant, the delivery fee varies largely from being free to S$10 per order. When we were finally done, we arrived at the final screen which should give you an estimation of when to expect your food. We were pre-empted that delivery during the peak period of 6 - 9 pm could take up to two hours and on this occasion, we were informed that the order would arrive in 90 minutes. 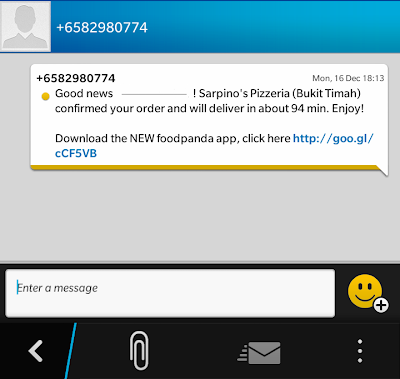 Upon the completion of the order via the app, I received a confirmation SMS within seconds! The pizzas finally arrived after 90 minutes exactly! Well, we secretly hoped that it would come sooner but at least it was delivered on time, as promised! The Aloha pizza comprised turkey bacon and sweet pineapples topped with mozzarella cheese. What made this especially good was that it was served piping hot! 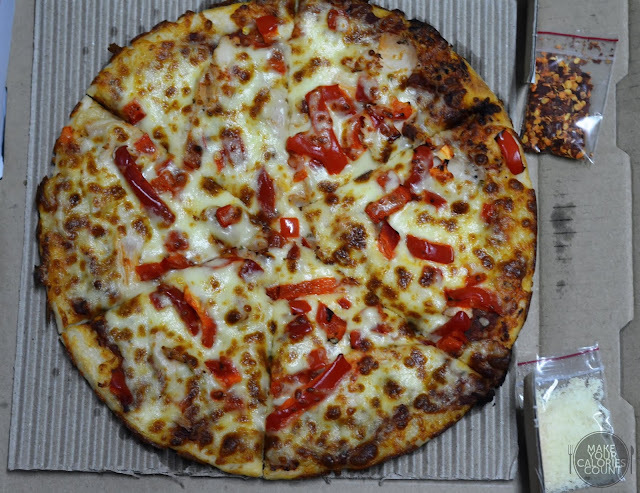 The grated cheese and dried chilli flakes were thoughtfully packed in sachets and taped to the side of the pizza box. You could see it from the melting cheese in the above picture! 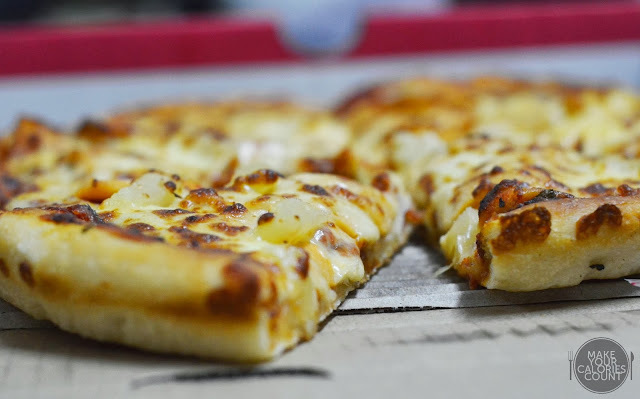 The regular pan version of the pizza was the usual dough-based and surprisingly, it was not too dense and had a nice crisp crust on the sides to complement the fluffy dough. Taste wise, it lived up to expectations of how a Hawaii pizza should be, with the exception that turkey bacon was used in place of the usual pork ham. 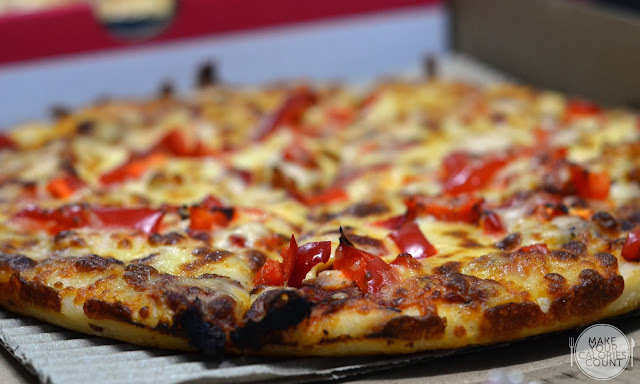 For the second complimentary pizza, we chose the 'San Remo', which had grilled oregano chicken strips loaded with sliced roasted red peppers, parmesan and mozzarella cheese. We also selected a different thin base which tasted much like a biscuit. For those with a 'fiery appetite' like me, do sprinkle the dried chilli flakes which packed quite a nice burst of heat. 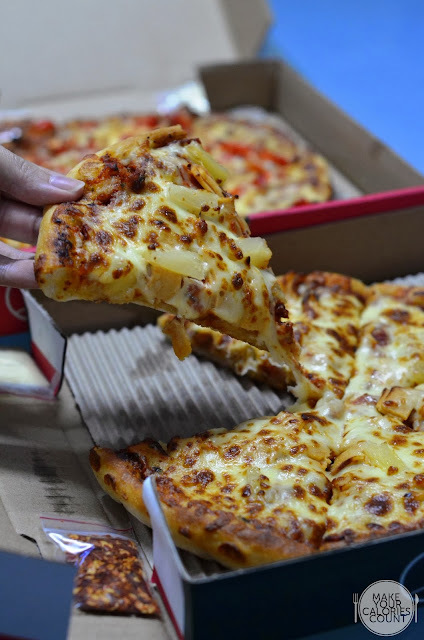 After the pizzas were delivered and some one, two hours later, I also received an email from Foodpanda which invited me to rate and review the food delivered. Overall, we enjoyed the hassle-free ordering system done through Foodpanda and what surprised us was that the food arrived piping hot! We were half-expecting it to come cold or luke-warm at best but for it to be freshly baked and served right to us, it was really impressive. The gentleman who delivered the pizzas was also courteous and very friendly. 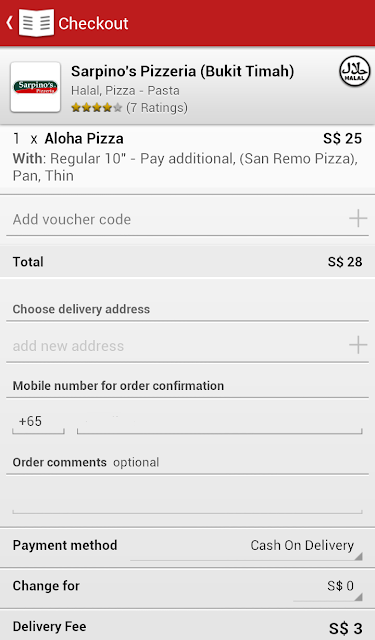 There were no further hidden charges apart from the price of the pizzas and delivery fees and the easy ordering experience just reinforced my confidence for online ordering service. More importantly, I am now no longer limited to the usual fast food chains for delivery food as Foodpanda also serves food from some top restaurants such as Chili's, Tony Roma's, PastaMania and even the popular 4Fingers! Start clicking to order your food today and make your calories count!